VX55245 BARNSTABLE, FREDERICK JAMES. Submitted by Glenda Atkins (daughter). Background : This document consists of Fred's personal life and war memoirs (which were two separate documents). I, Frederick James Barnstable was born on the 3rd of January, 1919 in the Private Hospital, Anstruther Street, Echuca. One of 11 children, I was the sixth child and fourth son of Richard Walter and Ethel Maude Barnstable (nee Hawkens). I was educated at Kanyapella State School No 2734 - a one teacher school. I did all of my education at this school until I was required to work on the farm, which always came ahead of our lessons. I cut Red Gum wood for the Paddle Steamers 2’10” long @ 4 shillings 6 pence per ton. I learnt to shear before I was 17 years old @ 21 shillings & 6 pence per hundred. I acquired a job boundary riding on an adjacent property – 10 shillings for 7 days a week and had to keep myself and pony. This taught me how to manage whichever way I could by living off the land and put me in stead for later in my life. This was a “before sunrise until well after dark” job. In 1935 my brother Alan, sister Ethel and myself were sent out to the property at Strathallan. We had to hand milk 36 cows morning and night and do the irrigating and the farm work, just for our food, no money, other than what we could scrounge one way or the other. In June 1938, Alan and I were put on quarter share each with our parents. The little income we got, most of it was paid back to them as we had to buy our share of stock and plant and now our keep so we still had little or nothing at the end of the month. 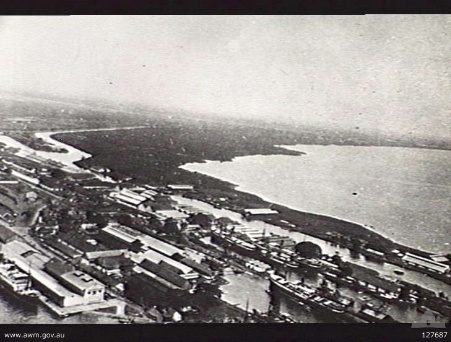 After the 1939 floods, the levy banks, which was supposed to hold the flood water back, had to be repaired and strengthened in the summer 1939 and 1940. Alan and I worked full time on this work until it was completed. It was hot, heavy work, six days a week. Alan got 7/6 per day. I was on the Scoop handles for 5/- per day and we got 3 shillings each for the four horses in the team. After War was declared on the 3rd September 1939, in October 1940 both my brother Alan and I were called up for National Service and attended the Drill Hall in Echuca and interviewed and medically examined by Medical Officers and were passed fit. Now we had to wait for a call up to serve in the Army. By the end of April 1941, as nothing had happened regarding call up, I decided to enlist in the A.I.F., so on the 7th May, I enlisted in Echuca and a few days later was issued with a Rail Pass to proceed down to Melbourne and then to Royal Park, which was the main recruiting depot. I was issued with uniform etc, dixie blankets, boots and my Regimental Army No. VX55245 and on the fourth day was issued with a five day leave pass. So home again I went, in my somewhat oversized uniform. 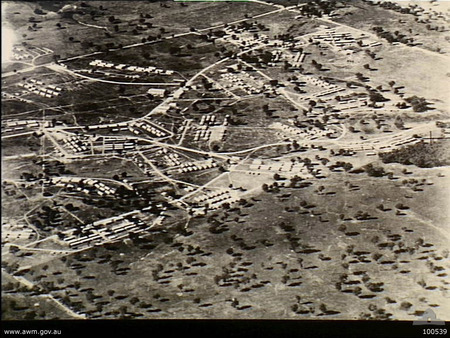 Back to Royal Park for about 10 days until I was drafted into an engineering unit and then proceeded up to Puckapunyal Army Base, Seymour, Victoria. After several weeks learning to march and rifle drill, there was a call for volunteers to strengthen the 2/2 Pioneer Battalion, so now we are the 1st Reinforcements to the 2/2 Pioneer Battalion, who by this time was ready to go on their final leave. So now I and my mates did our Engineering & Infantry training. On leave one weekend, Mum handed me a letter from the National Service to attend an Army Base at Nagambie Road to start my National Service. I say I cannot be in two Armies - I did nothing about it. Three weeks later on leave, Mum hands me a Registered Letter stating that I proceed immediately to the said camp or the Army Provos would arrest me, so this letter was taken back to Pucka and handed in to Battalion Headquarters to sort out. Nothing further was heard about the matter. Alan eventually got his call up and went into camp at Nagambie Road Camp, so I was able to visit him a couple of times of a Sunday. Later on I was put in charge of 15 other ranks and travelled up to Bonegilla, up out of Wodonga to do barge work on the Hume Dam. The next day I marched my group over to the Hume Dam and I approached who I thought was the Barge Master. All he said was, we should have been there at 8am, and refused further request to be allowed on the barges, so now this event for the week was spent marching about sightseeing, I rang Pucka and informed them I could get no co-operation on the Barges. They gave me the date and time to catch the train back to Pucka. 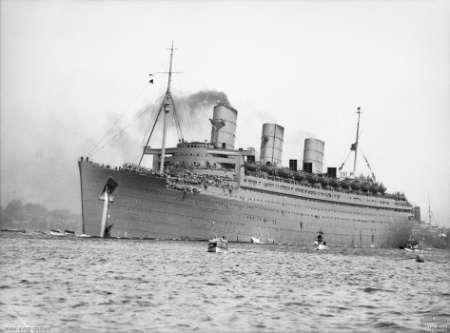 Soon after this event, we were sent on our final leave for 10 days, then back to Pucka and after a few days we were on our way to Sydney by troop train, where I boarded the Queen Mary on the 3rd September, 1941. We sailed to the Middle East, arriving at Port Tewfik Egypt, about 20 days later after a stopover at Fremantle, Western Australia and again at Trincomalee, Colombo. There were 13 thousand troops on board and over 1,100 ship sailors etc. So you can see we are pretty well packed in, the heat at night was terrific, no port holes allowed to be open during the hours of darkness, for safety reasons and no smoking on deck after dark for the same reason. On disembarkation at Port Tewfik, we were marched some distance out in the desert and were billeted down for the night under the stars. Next morning after Iron rations for breakfast, we marched back to the Railway at Port Tewfik and travelled by train up along the Suez Canal to El Kantara, where we crossed over into Palestine and then by Army transport to Hill 95 camp in about the centre of Palestine to the Battalion IJ Battalion. Now we are put through intensive training and route marches with sealed water bottles as a measure for further training and discipline so as to conserve your bottle of water. By placing a small piece of rock in the mouth or some other clean object, this helps to keep the saliva flowing and not the need to drink so much water. Your bottle of water was to last you at least 24 hours or you could be punished if this was not carried out. One was only obliged to give a dying soldier a drink out of your water bottle, so you can see the training is now really tough. Army exercise, guard duty and marches are the order of the day. I had two short leaves - one to Karfa and two days in Jerusalem. 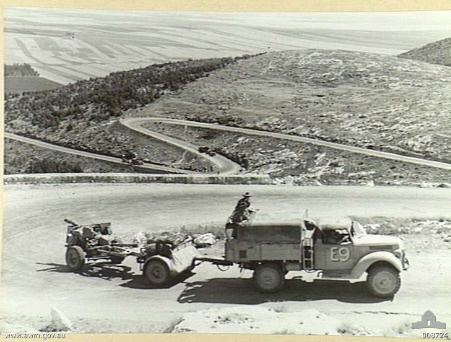 Then came our next move up to Syria by Army truck, arriving at Baalbek where the Battalion Headquarters were in camp. There were 20 of us taken to B Company at Rayak, about central Syria where B Company was camped in tents in an almond orchard. This was a real rocky area with tent ropes tied to almond trees and rocks at other places. We were issued with bed boards but then had to try and level up the rocks to prevent the bed boards from rocking about all night. Was employed doing fortification work by using jack hammer to dig holes in rocks big enough to place French tanks in with just the gun turret above the surface level and with ammunition pits behind them this was up the Rayak valley towards Turkey. After some weeks at this and with the winter closing in, I had developed a carbuncle on my right wrist and was taken by ambulance to Sir Weary Dunlop, 2/2 Field Dressing Station for 8 days till the big core came out of it and started to heal. Then back to Rayak and by now snow was falling every day and night. We now were issued with eight blankets but no straw for Paleases was available in Syria. We soon learn to fold one blanket lengthwise, half under and half over, then the next one the same, but on the other side, thus creating covering on each side of us. Instead of our head being against the wall of the tents, against the cold snow, we were allowed to sleep with our heads to the middle of the tents, which was against Army regulations and finally using the 8th blanket to bind them altogether, once we got in - which was an effort at first – and laid still, we were quite warm. It was the duty of one soldier to remain awake per night to rake the snow off each tent, as otherwise with the heavy fall of snow, the tents could collapse and smother the occupants. Luckily, our company Commander allowed us to build a cookhouse and mess room with oil burners for cooking, as now, no wood was available. We are now employed digging out roads, so as to keep supply trucks and communications open. This was now day and night work. We could not throw shovelfuls of snow over the side of the mountains as it turned into huge snowballs as it moved down the slopes, and then disappeared in through the roofs of some locals’ houses. So all the snow had to be slithered over the edge, sometimes this had the same rebuild as the big snow ball. One morning, a train arrived at Rayak Station loaded with camels, donkeys, sheep and goats and other goods from up towards Turkey. There was a snowplough on the front of the engine but by now the snow was too deep and frozen to be pushed on the line, so the train was going nowhere. After 24 hours, it was decided to let all the animals out of the trucks. We made available some for fresh meat, which we haven’t seen for some time. Also found a truckload of NAAFI Beer. This was also frozen and most of the bottles broken, so now we had icecream beer. We had to scape away the outside of the frozen beer to elevate the possibility of swallowing glass splinters. I bet the locals found a lot after the snow thawed out after we had left. We had a wonderful white Christmas. Major Daly saw fit early on to buy four small pigs and six geese and these were fed on waste from the cookhouse. They were killed for our Christmas dinner. Our new CO was Colonel Williams, who hadn’t been in command of the Battalion for long, from where he served as a Major in the 2/17 Infantry Battalion in Torbuk. He was with Battalion HQ at Baalbek, but somehow turned up at B Company for Christmas dinner. It was our first sighting of him. Our Officers waited on the tables for us, an old Army dedication and that is how we first met him, dishing out some roast pork to the OR’s. During the afternoon, they suggested that a football match be played on frozen snow. When you tried to kick the footy your back foot slipped back and you fell on your face on the snow. It was such fun but also some bad bruises etc. From now on there was only guard work, both in Rayak and our campsite. Often went out with a party to try and shoot gazelles. They were always too far away and too fast to bag money. So now it is Bulli Beef and canned vegetables etc. New Year very quiet, I had got to know a little Arab kid, who used to hang around our cookhouse, so I got a clean tin and if there was some of my meal over and perhaps from someone else it would go in to the tin for him and his mother. So later this became an event where I, and some of my mates got some washing done, which was a godsend as washing and drying was almost impossible. 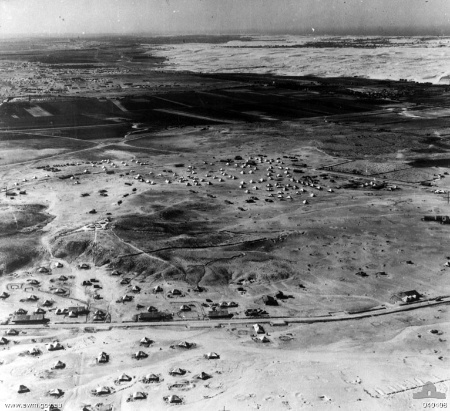 We move and arrive at a campsite known as Hill 69 (camp in background; Khassa Camp in foreground) in Palestine at 0550 hours. We have been on the road now for over 24 hours. The next week, we are handing all of our winter clothes and also six of our blankets and as we had three pairs of boots in Syria, as you had to have one pair of dry boots to put on before duty each day to prevent frostbite etc. Now, we are re-issued with summer weight clothes again and all 2/2 Pioneer signs to be obliterated on all equipment and packs. Now we were to be known as “The First Mobile Infantry Battalion” and our strength bought up to full strength with personnel from other training Battalions from different states. Those who were in Hospital in Palestine discharged themselves so they could catch up to us with only camp guard now, but no leave. 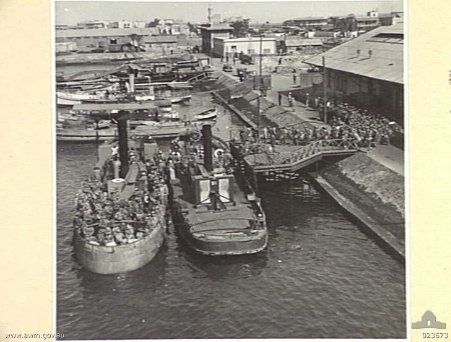 From El Hantara, the whole Battalion had to be taken across by ferry. Now we boarded a train and proceeded down to Port Tewfik. Now our baggage party with our extra kits and heavy arms are directed to another wharf than us and loaded on a tramp steamer, while the rest of us boarded the S.S. Orcades, which was anchored off shore. This took all night and at 09:30am on the 1st February, we weighed anchor and steamed off Port Tewfik. Stan Barlow was one on the baggage party – well known to me. He also had a brother Jack, who was with us. Instead of the Orcades waiting for the other ships to load with some of the rest of the 7 Division, she set sail on her own and was very fast. We are jammed up with accommodation and meals taken in shifts. Meals were good, could only take what we could eat, they wanted no waste. What couldn’t be eaten had to be returned to the kitchen and was dried for further use. On the 9th February, we sail into Colombo Harbour and I was one of the lucky ones to go ashore to help with the loading of further frozen rations etc. A few sick were off-loaded and left behind. Here we noticed a lot of damaged shipping – Ex Singapore we believe. 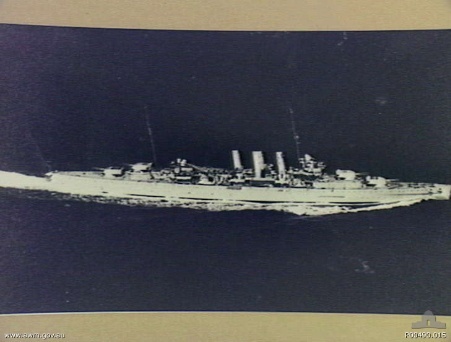 On the morning of the 13th February, 1942 we again set sail – still unknown destination, but now we are escorted by H.M.A.S. 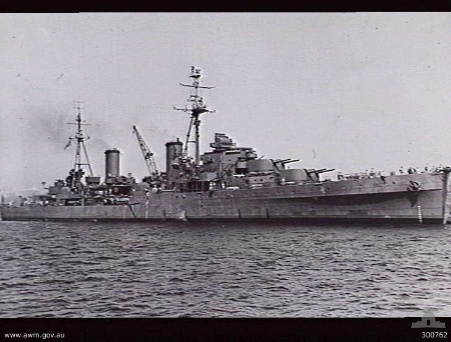 Hobart and H.M.S. Dorsetshire then both of the cruisers waved us goodbye and took off. 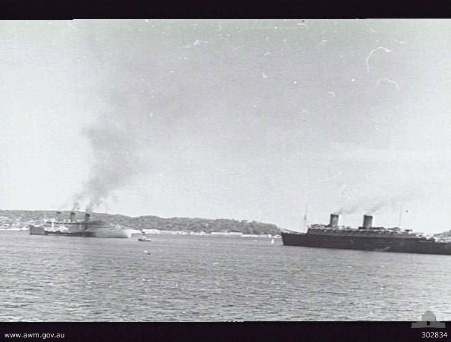 Both later sunk while we steamed on to Oosthaven (port of Teloek Betoeng) – a port on the south east of Sumatra. It was here in the darkness we disembarked on to barges and were taken to the wharf. No transport available to take to Palembang Airport, which was what we were to protect. This was just south of Singapore with plenty of Japanese air activity. We remained there until just before daylight when we were able to find the barges’ captain to take us back to the Orcades. Just on break of day we had to clamber up rope ladders to get on board and set sail now for home, as everybody thought, but our hopes were soon dashed when on the 17th February at midday we sailed into Tandjoeng Priok, port of Batavia, Java. And after a lot of cables being despatched to the Australian Government about our proposed landing and as I had been nominated runner from the ship’s Communications Office, I carried the final reply stating all troops had to disembark forthwith. If not, our Officers would be relieved of their command and other Officers be sent to take their place. So now, this poorly armed, had to disembark. First off was Sir Weary and his staff of the 2/2 Casualty Clearing Unit. Later he was to lead on board all of his female nursing staff. Thank goodness – otherwise more nurses would have had that terrible ordeal. We were transported out to the Batavia Airport and took up defence positions. Each day we moved from one position to another but always leaving some troops behind until eventually the Battalion was put in a defensive position at Llewiliang on one of the main rivers in the Island. C Company was making a good fortified position, close to the bridge. My Company B was over the main road from C Company, with no fortification whatsoever. By now we had found better Arms in crates on the wharfs. 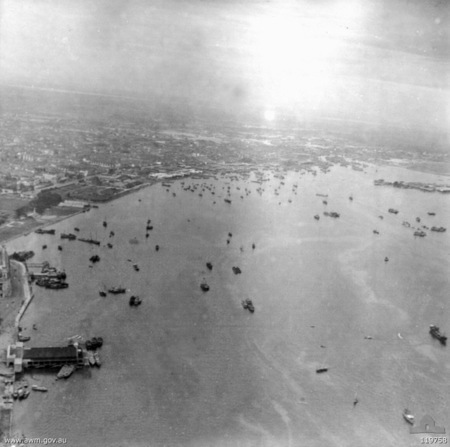 The Dutch had wired the bridge earlier and on the morning of the 3rd March, according to Dutch High Command, there wasn’t a Jap on the island and before we had made contact with the Jap army, the Dutch blew the bridge and about one hour later, a convoy of Japs arrived at the blown bridge over the river from us. When all hell let loose, we took them by surprise and inflicted heavy casualties on them. It was Colonel Williams plan to let some cross the bridge and then blow the bridge and then it was us to wipe out those who were on our side of the river, so now we have lost our forward plan. For three days parties of them forded the river and started their encirclement around our flanks and late on the night of the 7th March, we had to make a speedy retreat, before we became trapped. A Company became trapped and nearly all of them were lost, just a few escaped. We are now in convoy, heading along a mountain pass road, trying to reach a port down the south east end of Java, hoping that shipping may have been available to make an escape. Our transport drivers did a marvellous job turning the Army trucks around on a mountain pass, just a little wider than the tracks. Some crashed thousands of feet below. All had to be out of the trucks owing to the danger. We arrived back at a tea plantation and had our first meal in nearly two days with plenty of tea. We then move back to a village named Leles and were camped in a marketplace. Having suffered heavy casualties, the Dutch capitulated and I became a Prisoner-of-War with the rest of the Battalion on 9th March, 1942. We saw very few Japs and were pretty well fed and rested and we could walk on to another village that had a swimming pool and where the 2/3 Machine Gunners were in camp. This was great while it lasted as we could see Japanese Sea planes off shore. Fred Tubb, my officer, several others and an Air Force Captain Jim Sutherland thought of an idea, that I had to swim under water each day till I could do the 50 metres without surfacing and then do more. Eventually I got to about 60 metres and they decided that I would have to get closer to the sea and watch when these planes were refuelled. Then they found out that they were refuelled at daylight. So then the whole idea of escape was abandoned as it was only possible to get aboard these aircraft in the dark, and that is why I had to swim as far as possible under water to create a surprise attack. Soon after this was abandoned, we were moved by train to Batavia and then marched into what became known as the Bicycle Camp, Dutch Army Barracks. This took place about the 13th April, 1942. 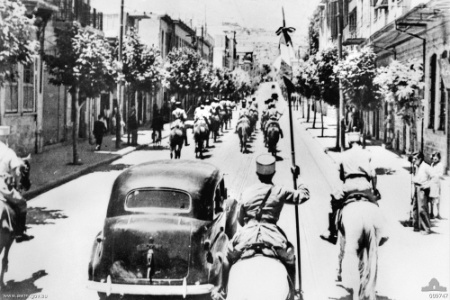 Now we are under Jap control, bowing to every Jap that was in sight 24 hours a day. As the Japs marched up along the road through the camp, all in the hut compounds had to come to attention and bow and bow properly. This was such a nerve-wracking experience we had to put up with. On arrival here, we were astounded to see human-like skeletons stark naked moving about this Army camp, only to find out they were the survivors off the Perth Cruiser and Americans off the Houston battle cruiser sunk on the 1st of March 1942. These ships, I believe, were to be the only means of escape. They were prisoners well before us. Work partied each day, some to the wharves, some to air fields, filling bomb craters etc. Other parties went to oil refineries doing repair work - this went on seven days a week. Later, all high-ranking Officers were taken from us for interrogation. They were put through terrible torture week on end, but all stood firm and all carried their scars for weeks later. We were supposed to sign a “No Escape Declaration”, which we were told by our Officers not to, as would give the Japs the right to execute all they deemed to be escaping etc. For three days we refused to sign. They even turned the camp water supply off at the beginning of the third day. With no water for the kitchen or for drinking, we were now forced to sign under duress, which didn’t mean a thing to the Japs. Most allied P.O.W.s are now held here, with some still scattered around the Island of Java. On the 7th October, we were lined up on the camp road with all our kits. This is where the Japs did their most detailed search of all our belongings. They took knives, forks, all writing pens, pencils and all paper that they could find, unless these items were well hidden. I had been keeping a diary since leaving Australia and had always been able to have it well hidden, so that night I was able to fold it up and seal it in a big jar and bury it in the compound, hoping we would remain in this camp. But the next morning on the 8th October, we were on our way, another destination unknown. We went by rail from Batavia, back to Tandjoeng Priok to climb aboard a Jap freighter (Kenkon Maru) down into holds at the bottom. On this ship there was just standing room or lay over one another’s legs. We arrived in Singapore harbour on the morning of the 12th October climbing out of the holds and disembarking and taken by truck over to Changi Jail. 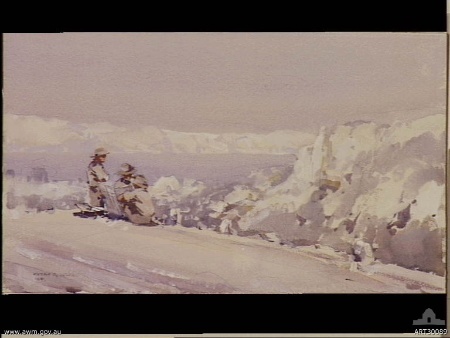 There we remained in the trucks for some time and then we moved on to British Barracks, overlooking the Strait of Johore. We are now guarded by Indian Sikh, who were British Soldiers and had gone over to the Japs. Here we tried to get additional clothing and boots but to no avail. We received a small amount of British Red Cross items – the first we ever had, but too small to be of much use. We are now taken back to the Dock at Singapore on the 14th October. We board an old Jap craft named the Maebashi Maru. This is much smaller than the Kenkon Maru and again we are jammed in right down the bottom of this awful tub. Only way out was to climb steps up the staunching and out the top. For toilets we had to climb over deck rail and on planks hanging over the side of this vessel. It was a real effort. Meals and water were very scarce as there were 1,500 P.O.W.s on board with only those allowed out were those who could climb the staunchings. The rest relieved themselves by lifting the decking and dropping it down into the ships billings. I was right at the back over the shaft that drove the propeller and found a big rust blister about a foot above where I was. After scratching it a while, was able to get it to leak in some seawater and was able to cool a few of us down somewhat. We dared not do any more to it as it could have become dangerous. This voyage was indescribable – the heat, the stench and lack of food and water - so on the afternoon of 23 October 1942 we arrived at Rangoon, Burma. This night was the worst as there was no movement and no air at all, mosquitoes and sandflies. 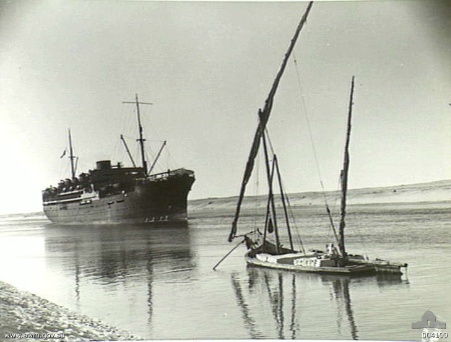 Next morning we climb ashore to again be driven down into the lower deck of another smaller ship - the Yamagata Maru - to sail across the Bay of Bengal and up the Salween river up to Moulamein and anchored that night and taken off by barges and marched into the Moulamein Jail. There I was in a cell for two prisoners and now it held eight of us. We were able to fill water bottles and sat up all night. Next day we march to the Railway Station and crowded into railway trucks, and now we are on our way to Thanbuyayat – the start of the Death Railway on the 26th October. Here we met up with the first P.O.W.s that had been shipped up earlier and had started on the line work, and received our best meal we have had since leaving Singapore. The next day we were formed up into what was to be known as Kumis, being 50 troops, an Officer as a Kumicho and a Captain is now in charge of two Kumis. He is known as a Hancho, so on the 28th October, we arrive at the 35 Kilo Camp to start our toil on the Death Railway. First we had to clear the line site and then start to build the embankment, we worked in threes. I had two older men who did the carrying and I did the pick and shovelling – one metre each per day. This was later increased up to three metres per man, now it is nine square metres to dig and carry. It is now a real task as you stayed there until you completed the task. It is now the hot and dry season with most watercourses dry and the camp is now supplied by well water. We had to sink and timber it up to prevent it falling in. The camp workers had to keep digging it deeper and sometimes it was just enough to keep the camp in water for cooking and drinking, no washing or bathing. I am in Williams force, which contained 867 out of the 1,500. The rest were known as Black Force and they started at the 40 Kilo. We worked forward until we met up with the Black Force and then we worked back towards those at the 30 Kilo camp, they being Colonel Anderson’s Force. Later Williams & Andersons forces became amalgamated and worked together from about the 24th April until the line was completed in Thailand. After completing the embankment and cuttings up as far as the 45 Kilo camp, where at this camp, on the last night we were there, we had completed our quota late in the evening and was adamant that was all we would do. The job was not complete as the Japs indicated. We then went on a sit down strike. The Japs didn’t know what to do and started belting in to us to no avail. Some Japs left and much later brought back machine guns so now it was back to work by firelight. During this time somebody added their picks and shovels to the fire and then all hell broke out and things really started to get out of hand. Fortunately our two High Officers and the Jap Commander arrived and saved a very terrible situation. The job finished after sunrise, then back to camp, a meal and then a march back to the 26 Kilo Camp, no sleep by this time now for nearly 40 hours. From here we are the sleeper and the rail layers and the doggers and the ballasters, all the way till we meet with the Thailand end of P.O.W.s at a place called Konkwita in Thailand on the 25th October, 1943. It is now nearly 12 months since we first started on this Death Railway. Our last working camp was known the 131 Kilo camp from Thanbuzayat and the line was joined at the 145 Kilos. We had to tramp from our camps to work and back after sometimes up to 26 hours on the job, sometimes with only two meals during these long hours. Some of the worst jobs were with the Kumis that had to do the bridge building. This was all done manually, cutting the piles in the jungle and getting them to these massive rivers. At one stage I was put on the job to put a three-sided point on the piles with an adze, which normally was used for trimming timber. It would have been much easier to sharpen this timber on four sides instead of a three-sided point. Unless this was done straight and the steel shoe fitted straight, the pile would drive in crooked and be out of line. There was no way of fastening the steel shoe onto the point of the piles, no holes bored in them to fasten them in place. Then we had to bore a 2-inch hole in the centre of the top of the pile for the pile driver rod for the pile drive to slide up and down. This also had to be done straight. If not, the pile driver would crash down crooked. The pile driver was pulled up on this guide, say 5-6 feet and then let the ropes go all in unison, otherwise those who did not let go in time became airborne head first towards the pile. The pile drivers used to weigh six hundredweight in old measurement. There were eight men on each side, pulling on ropes to lift this weight up about eight to 10 feet, which was a hell of a task. Sometime you would be standing all day or night up to our necks in the river water, with small fish biting into us. This is what it sounded like when on this terrible job, to start to tighten the ropes, then Inchi Ni San, go was all to let go and the pile drivers would crash down and perhaps start the pile on its way in position. One river, the bed was just rock and it was a terrible job to get the piles driven in at all. At one stage, the Japs went away and brought back iron and cement and they thought they could cement the piles to the riverbed. This just showed their mentality as we could see the cement being washed away and only sand remaining within the iron. One bridge in Burma was washed away twice before we got to lay the lines over it. We are now into our second big wet, when the rain could be measured in feet, not in inches. Most of us are naked and bootless and with no blankets, as all has just rotted away with the wet and sweat. All tropical diseases are at their worst. Beriberi - this was brought on by the lack of vitamins, when the body just filled with fluid and the worst cases just drowned in their own fluid. Malaria was always with us as we were at the mercy of the mosquitoes. Dysentery is now at its worst as the flies are that bad it is impossible to keep our food and utensils away from them. The most dreaded tropical ulcers are now taking their toll. No medical supplies whatsoever from the Japs. I had two occasions when things could have gone either way but the power to live won the day for me. A Japanese guard slammed a sledgehammer into my head when I damaged a railway sleeper on the Death Railway. Fortunately, a gang working up the line heard my groans when they returned to camp that night. It is unknown to me how long it was before I recovered well enough to join the gang again. During the big wet, it was a great effort to get the rice up from the end of the line we were building to where we were camped. This was the job for the sick. Our breakfast was known as “Pap a Dutch” dish - rice boiled until it became a fluid and we drank it. The Japs always moved us ahead of the line, so we always had to walk back to work. We were expected to lay five kilos of rail a day and had to stay there until this was done. That was if they could get the rails and sleepers up to us, as there were always washouts along the way. Ballasting was the worst possible job. This rock had to be driven under the sleepers with ballast picks, similar to a one bladed pick with a piece of metal welded across the point. This was what broke the skin on our shins. And then infection set in. After I came home I had a lot of rock chips removed, even many years later. There are still some fine pieces that can be felt at times. One of the worst camps we were ever at was the 116 Kilo Camp. This had been occupied by the Burmese. There were dead everywhere and filth all messed up with mud, which was over six inches deep in the leaking roof huts. This is where I suffered with Anaemic Dysentery. When all hope of surviving this complaint was practically nil and if I remained in the Hut of Death I wouldn’t be here. I crawled away from this and went back to the workers hut and they cared for me, when they could. At that time a Dutch industrial chemist and another Dutch Chemist were able to extract Emmetene substance out of Jungle plants, and I was one of the first to have these injections, which I am sure saved my life. My cross had been made for me, so you can see it was touch and go. When the line was completed we were still at the 131 Kilo Camp and early December, I was picked with a party and we moved along to the Camp known at Niki Niki. 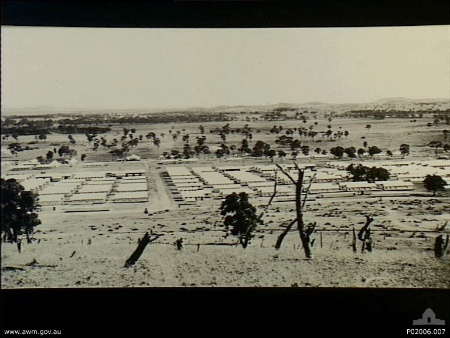 This was a big camp – one of the Jap’s supply bases. Food was somewhat better here and we stayed here for about a month and then were railed to a camp in Thailand, close by the Bridge over the River Kwai. 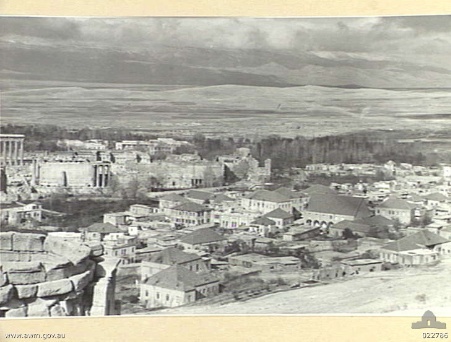 The camp was called “Tamarkan”. Things were a lot better. 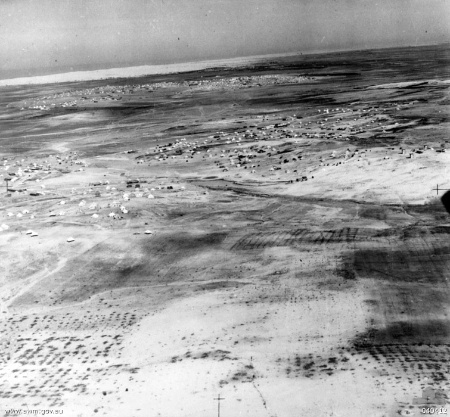 There were thousands of P.O.W.s at this camp and a few miles away was another known as Kanburi. It was at the Tamakan Camp that, after my health picked up, I got a job in the Woodshed with six others, cutting and splitting wood. The axes had a one inch pipe for handles and they jarred our hands. This was very constant work and we also got a bit extra ration. About May 1944, I was picked with four others out of the wood shed for the draft for the trip to Japan. There were about 2000 of us who travelled by rail, over to Saigon in what was French Indo China. Here we were camped between the Mekong River and the railway yards. After several weeks here and all ships that left here were sunk, we as two groups, were again transported by rail down to Singapore. This took 17 days in steel trucks. We had to cut wood to fuel the engines and carry water out of streams for the engine boiler. Food was again very scarce. Arriving back in Singapore with the second group we were housed in what was known as the River Valley Camp. 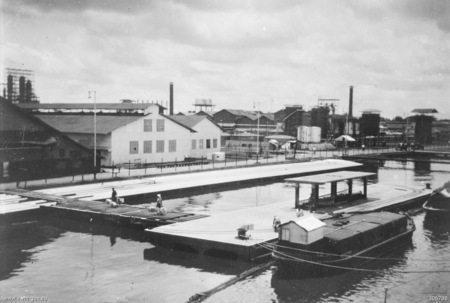 After a few weeks, most of the party was taken to an Island off Singapore – “Keppel Harbour” by barge and was taken back each day digging a Dry Dock. When this project got about 10 feet deep and the heat was so bad, we were taken out and had to work at night. This went on for weeks. Tramlines were spaced about and skips on these were filled with soil and then they were hauled out by winches and taken out over the water, where it was dumped. 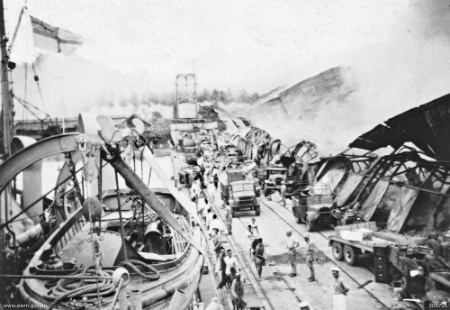 When this massive hole was completed, we were taken back to the River Valley Road camp and early 4th September, a large part of this group was shipped from Singapore on several cargo ships in a convoy to Japan. Luckily, I missed this group because this whole convoy of ships was sunk by American submarines on the 12th September with a terrible loss of life. The same submarines came back about four days later and rescued some survivors. About 12 Pioneers were among those rescued, and nine others were picked up by a Japanese Whaler and taken to Japan. 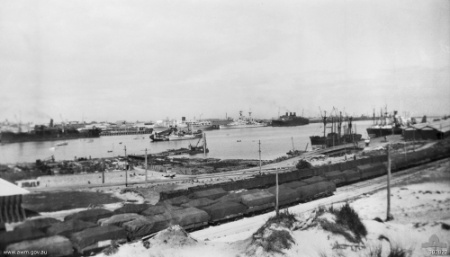 On the 16th December, 1944, I was with the group that was shipped from Singapore on a Dutch Cargo vessel, loaded with pig iron and bales of rubber. Unknown to us, this ship had survived a torpedo attack and there was a huge hole right through the bow when we left the wharf. It started shipping water and for the next 10 days we were anchored out in the bay. We had to move the rubber and pig iron back right down to the bottom of the ship. They then boarded the front up and then cemented the whole area. On the evening of the 26th December we set sail again. Now with all this extra weight in the bows of this vessel, she ploughed along with its nose down. By this time we are about cooked, being locked below decks all this time and laying on bales of rubber of all things. Our voyage is slow and we arrive at some port, which was in Korea, where we unloaded both rubber and the pig iron. It is now cold and snowing and we are wearing tropical clothes. No names up on the port and when we leave we appear to be sailing back from which direction we came. Later we dock now at Mojre on the bottom Island of Japan. There are inches of snow on deck. It is about the 18th January 1945. As we disembark we are handed one cotton blanket and a rice ball that is frozen hard - too cold to hold and too hard to eat. This, I think is the coldest night that I have ever experienced, lying on concrete floor, cold and hungry after being in the Tropics now for about three years and our blood is really thin. The next morning, with a feed of rice and a cup of something that may have resembled tea, we march some distance to a railway and are loaded on carriages, which are totally blacked out as we cannot see out or see anything at all. At this stage I cannot recall how far we travelled and for how long. We arrive at a coal mining town of Sendai in a district known as Fukuoka. Now we have to walk with the little we can call our own, over frozen snow into this well-established camp. Huts had tiled roofs with mud brick walls and lined with rice straw. There are big rice straw mats on the floor. They would be at least four inches thick, quite comfortable to lie on, if it wasn’t for the fleas and bugs. In Burma we were fed lice and bugs all the time. We are now issued with what we thought were woollen blankets, three each, but alas they were manufactured out of seaweed – the same as all the clothes the Japs issued - always felt damp and clammy. After several days being taught to walk like ducks, bent right down with body upright, we had to shuffle along, the same as we had to do down the mine. The coal face didn’t average one metre high. After about a week, we were divided up into two groups, one for day shift, the other for night shift. Our ration now consists of a mixture of rice, barley and millet seed and measured out at approximately 330 grams per head, which was equal to a small cup full three times a day. Occasionally we would get a small piece of squid or octopus on our rice mixture, about 1½inches long. Only vegetable available was salted cabbage. Hell, this was rank. Other times we got a dollup of seaweed as an addition to our food, so we ate, wore and slept in seaweed. All heating and cooking was done by steam from the retorts, on top of the mineshaft where they were producing petrol from the coal. We shared big bathing boxes about 12ft square on about three feet deep. The water was heated somewhat by steam. There were always dozens of old Jap women miners in the next shaft to ours, who had to share these bathing boxes. This mine face is under the sea and is very wet with water leaking in all the time. They had pumps set up at various places to pump the water out if and when this system broke down. We were soon taken out till these breakdowns were fixed. It was always wet but warm down there, but when we came out during the winter our wet clothes froze to our bodies. Luckily after about three months of this, Spring arrived, the snow at last melted away, and by early August it was getting quite warm more ways than the sun. We could continually hear air raids taking place about us, but luckily not nearby, until the morning of the 6th August. When the whole camp was so much overcome, it was a long time or it appeared so before there was much cheering etc. Some just collapsed, others just stood there hugging as many as our arms could fit around. A few hours and all the Japs took off out of the Camp. So now we are on our own after just over three and a half years. I was selected to man the first guard on the gates, which were three. This was to keep our boys in as nobody knew how the Japs would react outside. There was about a 10 foot wooden and barbed wire fence around this camp. A few days later the American Air Force dropped by parachute 2 x 44 gallon drums contain food, clothes, medication and such items, but unfortunately they dropped all this in what were rice paddy fields adjacent to the camp. Unfortunately a lot of these containers broke loose and were buried in feet of water and slush. We salvaged what we could, and how we made ourselves sick eating canned chicken and ham and some other Yankie Army rations. Cigarettes, some put as many as would fit in their mouths and lit them all, just to see them collapse and hit the deck. I don’t think anybody had a good night that first night, the food being too rich for our stomachs. A few days later a plane decided to drop another cargo right in the camp. Luckily no-one was injured by this cargo of material. D.D.T., lice and flea powder were used freely and we slept in it. Later it was banned. Apparently it had no bad effect on me. When I was first weighed after about three weeks on all this wonderful food, I weighed just under 5 stone, so at War End, I could have been much lighter. At the end of September 1945, we were put on a train and travelled south and had to clamber over two bombed bridges and got on another train. This happened twice until we arrived in what was left of Nagasaki after the Yanks had re-laid some of the railway line that had just melted with the Atomic bomb. Here American Medical staff took over. We once more stripped naked, our new clothes discarded. We now file through de-lice and vermin sprays, are thoroughly wet and then put through a plain water spray, then moved on to medical examinations, still in our birthday suit. We had a full medical, then on to re-clothing and boots etc. This is where we again lost what were to be our souvenirs, etc. I was to be put on a hospital ship with some others, and was considered to be put on an aircraft carrier as a troop ship for the first part of our journey home. I refused this and said I wanted to go home. Those who made this trip to America came home far better than what the rest finished up. We set sail all bunked down on camp stretchers on a hanger deck and was only to be on board just over 24 hours heading for Okinawa, but suddenly we ran into a typhoon and finished over on the coast of China and it took over two days to sail back. The second night on Okinawa, we attended a concert and as it is nearly dark, I noticed a seat up towards the front and lo and behold I sit down next to a good mate, who we thought had drowned in the group that was sunk going to Japan in September 1944. He was one that was picked up by the Japanese Whaler. Early next morning we are aroused for breakfast, loaded into trucks and set off to several airports for a flight to the Philippines. I had never seen so many planes and each time we pulled up to a bomber, the crew said we are not airworthy and on we went. Eventually we found one and we climbed aboard and to sit down and not move about, as the bomb doors was still operational as we were to find out. Three Dutch personnel started to walk about against orders and away they went out of the bomb doors. I still see them disappearing, there was no way anybody could help them. Several hours later we land at an airport and are taken by truck by an Australian Army Recovery Corps. Here again we go through the same delousing and clothes issues, medical, dental and each one was able to talk on radio with messages from home. There were letter writing places and they were always crowded and you had to queue to get in to write. By that time your name was called to go for some other medical. We were treated well but had little free time to ourselves. It was quite common to see P.O.W.s march out of their tents in a naked state, as now we are again in the tropics. This was done as a force of habit. We are here for nearly three weeks, so early one morning we are on the move again to a seaport and are taken out to the British Aircraft Carrier, where we are again bedded down in the hangars below the flight deck. This was a very pleasant cruise with plenty of assistance from the crew. I have a photo of the flight deck that was damaged by three suicide Jap bombers that really made this aircraft unserviceable by denting the flight deck about six inches. On the 16th October, we arrive back in Sydney. Great crowds are everywhere. 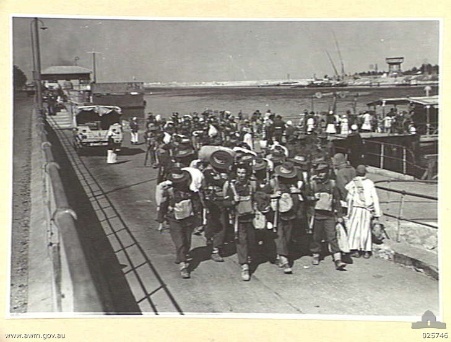 We disembark and are sorted out from what State we were from, loaded on buses and driven through the streets of Sydney, then out to the Ingleburn Army Camp for lunch. We are now drafted into our home States. NSW (NX) personnel and Queensland (QX) personal are being issued with their food rations, tobacco ration and fit enough to go on home leave. Victorian (VX) and Tasmanian (TX) are now called up for the same ration cards. South Australian (SX) and West Australian (WX) got theirs the following day. VX and TX were warned that it was proposed that we were likely to be entrained for Melbourne later that day. This was eventually done, entrained about dark and arrived Albury for breakfast. We are at Spencer Street station just before 12 noon and were taken by buses for a tour of the city and then out to the Showgrounds. We were turning to go to the Showgrounds when I noticed my father, my Aunt Mary and sister Amy at a tram stop at Flemington Bridge. So when we were taken to this building with thousands of people milling around, it was nearly impossible to find anybody. I happen to see an Army Officer with a mike in his hand and I took it and announced my presence and then I was soon confronted by my family. Babble made it impossible to speak, so I asked the Officer about leave passes later that day. We left Flemington and caught a tram back to the city and out to St Kilda to Aunt Mary’s for tea and then back into the city and we stayed at a hotel in Spencer Street and caught the train home to Echuca just after midday on the 18th October 1945. We had a meal at the Taras Hall hotel and a couple of beers and then home to Kanyapella. Oh hell, since we arrived back to Sydney, things happened that fast. I wasn’t able to keep up with the Great Events that had been unfolding in such quick time. There is far more to this history of a Private in the 2/2 Pioneers that could be told. I joined the Elwood R.S.L. whilst I was still in the Army in February 1946, whilst I was still a patient in the Heidelberg Military Hospital. I was admitted there about the last few days of October 1945. 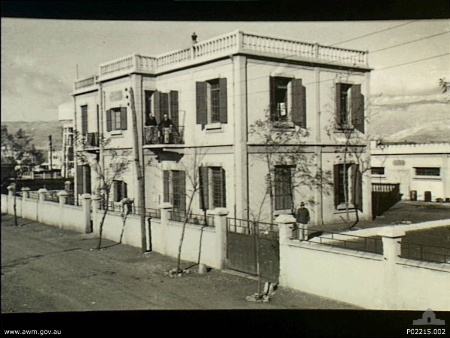 I remained in this Hospital until I was discharged on the 2nd of April, 1946. I had some weekend leave but not worthwhile going home to Echuca. Melbourne Sub Branch members called nearly every day trying to get personnel to sign up. Membership was just 10 shillings back in those days. At the time I spent some weekends with my Aunt and Uncle, who lived in St Kilda. So when I was first discharged I stayed with them until my parents sold and came down to Hampton. After I got employment out at Moorabbin at McGrath Trailers, sometime after this I was picked to do a Rehab course – French polishing at Brunswick Technical College. When I finished my course I got a job in a furniture factory in South Melbourne, then I was transferred to a factory up Spencer Street West and later in 1947, I took a job in a furniture factory in Carnegie. By this time I was boarding with my parents at Hampton and I used to ride my bike to work from Hampton to Carnegie and back each day. Myers Furniture eventually built a new factory in Highett, so now it is closer to where I was boarding. I started in this new factory in January 1948 and I now became a Member of the R.S.L. Hampton Branch and paid my 1948 membership as I still have my receipt. By now, Flora and I had been going together since early 1947 and were married on 6th August, 1949. After our honeymoon in Tasmania, Flora and I moved back to the old farm at Kanyapella, Echuca and I joined my brother John in a share partnership. When I joined the Echuca Moama Sub Branch R.S.L. 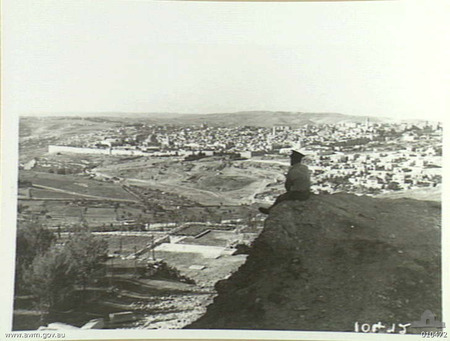 it would have been March 1949, while building our home by the Goulburn River. When that was finished we rebuilt the dairy and put milking machines in and milked up to 70 cows. I attended a lot of R.S.L. meetings when I could back in those days, even before I got my first motor vehicle – an Austin Utility, when my Army Gratuity came through in March 1952. I had kept on applying for Soldier Settlement Blocks and finally I had drawn a block at Waaia in early December and we had to move in just before Christmas, 1955. Flora & I moved to Waaia with our furniture and household effects. I was lucky enough to get a new milking plant and separator into the dairy before Christmas etc. Then I returned and sorted out the cows – 34 of them and transported them together with the young heifers and some calves and pigs. I joined the Waaia R.S.L. Sub Branch in February 1956 and now I was able to attend the meetings regularly. The meetings were then held in the original Waaia Public Hall, until the Branch was able to acquire an Army Hut that was transported from over near Rushworth. With working bees, it was soon put into shape with internal walls taken out and with just one wall left in, creating a kitchen and/or a meeting room. I was elected President of the Branch in January 1960, 1968, 1969, and again in 1982 and 1983. We retired from our farm and moved in to our new home in Numurkah in May 1982 and I still remained an active member of Waaia until, owing to lack of members, the Sub Branch was closed down in 1987. I continued to be a member of the Numurkah Sub Branch and in September 2003, I received a Life Member Certificate and badge for my Service to the R.S.L. I became involved on the Waaia School Committee and served as President for many years. I was involved with the building of the new Waaia Public Hall and served as President of the Hall Committee for many years, and resigned several years after we had retired into Numurkah. I joined the Murray Goulburn P.O.W. Association in March 1956 and served on that Committee and held the Chairmanship of that five times. The last 16 years I became the Accommodation Officer, which was a very demanding job to see all had beds for the weekend of the P.O.W. Reunion, up until our Grand Final year of 1999. For 50 years, this Reunion was held in Numurkah and helped to put it on the map. I was invited to join Numurkah-Nathalia Legacy Group in May 1970 and have now served 33 dedicated years with them, holding Chairmanship three times and have had up to 12 widows on my books to care for and visit each month. In 1988, I became a foundation member of the Numurkah Probus Club. Each member is asked to give their life story address at the meeting. I have had the pleasure of speaking three times over the years. I joined the Numurkah Bowling Club way back in the Sixties. I was never a champion bowler, but have won quite a few tournaments over the years. I have served on the Committee for several years, and have also served as Barman. I have played both day and night Pennant Bowls over the years. I have enjoyed my bowls and have played in team events for the ‘60s-and-over’. I have my Veteran’s Badge and also my Super Veteran’s Badge on attainment of 80 years. All of this Community work that I was engaged in over many years was greatly helped by my devoted wife Flora in her willingness to see that I was able to carry out what I thought was my obligation and service to the general community in many of the public positions that I tried to help. Also thanks to our family, Terry, Lyn, Glenda & Heather for their support and help on the dairy farm whilst we were establishing ourselves in the earlier days at Waaia.